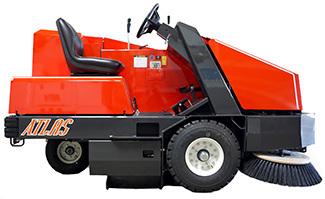 This exceptional ride on sweeper offers unmatched engine accessibility, which saves maintenance times and provides for a longer engine life. 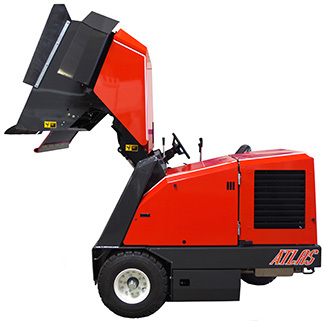 The Atlas 64 comes complete with the Safety Vision Dumping System, which allows the operator to easily and safely dispose of debris at heights up to 60 inches. Cleaning Width & Rate/Hour: 184,800 Sq. Ft./Hr. Unmatched accessibility for routine engine maintenance saving time and providing longer engine life. It’s like having an engine on a workbench. 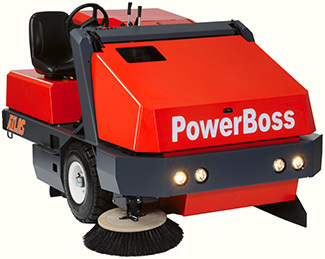 PowerBoss uses the latest most fuel efficient engines on the market. Complete with the Safety Vision Dumping System, this feature allows the operator to safely, easily dispose of the debris at any height up to a standard 60″ waste receptacle. The hopper also features a large opening for material which should not be swept, providing the operator a convenient place to deposit materials that would otherwise be left behind. Provides a safe, clear view of the hopper position when emptying debris into the dumpster. This feature is designed to provide safety when dumping and to minimize accidental damage to the machine. Stage 1: Vacuumized main broom chamber. Stage 2: Perma Pre-Filter helps to eliminate dust before reaching the panel filter. Stage 3: 95 ft2 Synthetic Panel Filter. Stage 4: Aggressive, filter vibration system to release the dust from the filter. The ATLAS features a massive one-piece, unitized 1/4″ thick steel frame. This rugged style construction provides a longer more durable machine life. The PowerClimb -The PowerClimb feature with 23″ diameter tires easily maneuvers over rough terrain, including speed bumps and standard 4″ curbs. 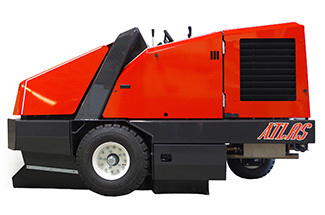 This extra ground clearance provides the opportunity to sweep sidewalks and medians without damage to the machine.